There is! To demonstrate, I’ll use the last dozen films of one of my favorite filmmakers, Alfred Hitchcock. 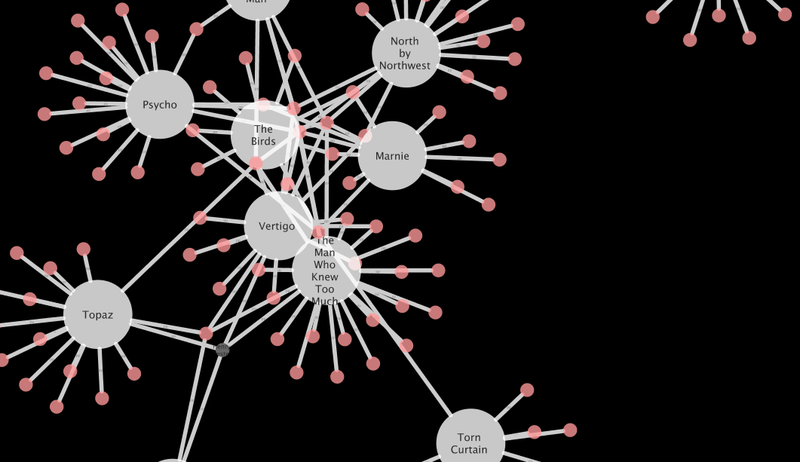 This is a fun way to get started making network visualizations. 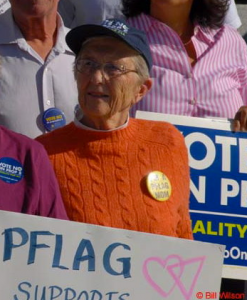 Dody at a PFLAG (Parents and Friends of Lesbians and Gays) rally in 2008. This was her Facebook profile photo! Today is Ada Lovelace Day, which celebrates women in science, technology, engineering, and mathematics by honoring Ada Lovelace, whom many name the first computer programmer. My Ada is Dora B. Goldstein, or Dody, as everyone called her, who died Sunday. She was a pioneer in so many ways: one of the first women to enroll in Harvard Medical School, a leading expert on the pharmacology of alcohol, and a professor at Stanford. She was also a civil rights activist who campaigned for women in the academy and, later in life, a leader in the gay rights movement. She was also my husband’s grandmother, which is how I knew her — a great cook and attentive listener who was so interested in what we were up to. She punctuated our stories with “How wonderful!” and made us feel important and loved. She was a person of endless compassion, curiosity, and intelligence, a role model for me. We’re lucky to have known her.